Appalachian Power Co. is asking state regulators in Virginia and West Virginia to approve 225 MW of new wind generation from facilities located in Ohio and West Virginia. The Roanoke-based electric utility, which serves roughly 1 million customers in Virginia, West Virginia, and Tennessee, already has 375 MW of wind generation, with another 120 MW coming on line in 2018. With the approval of the two new projects, the company would have a total of 1,000 megawatts of renewable energy (wind and hydro). The 175 MW Hardin Wind Facility will be located in Hardin County, Ohio, and the 50 MW Beech Ridge II Wind Facility will be in Greenbrier County, W.Va. Both wind projects are under development by Invenergy, LLC. Appalachian Power operates in both Virginia and West Virginia. Our customers share in plants in both states… hydro and natural gas plants here, coal plants in W.Va. Historically, we have also owned or partly owned plants in other states (generally coal) too. In this case, these two facilities were proposals that came out of the RFP we issued in 2016 for wind generation with a primary requirement being that the new plant had to be interconnected with PJM. Both of these are. We had a number of proposals in response; these two — and one other that was also approved will be in Indiana that we will not own, but will purchase its output by long-term contract — provide our customers the best deals. (I will note that it has been hard to get a sizable wind facility constructed in Va. so far). If you recall, the RFP for utility scale solar we issued earlier this year calls specifically for construction to be within our service territory in Va. or W.Va. We received numerous proposals for that RFP too and are reviewing the best opportunities. The problem here is not obstruction or foot-dragging by Virginia’s electric utilities. Appalachian wants to own Virginia-based wind power. A big part of the challenge, I suspect, is the paucity of viable utility-scale wind sites. Also, wind farms in the mountains are strung along ridge tops, almost invariably stimulating resistance from locals who don’t want their views marred. If Virginians want more wind power, we may need to take a look at how local zoning codes empower NIMBYs and hamper wind development. Another lesson: If you like wind power, you’d better like the transmission lines that enable electrons in Ohio and Indiana to flow to Virginia. As renewable wind and solar make gain an increasing share of Virginia’s electric power mix, Virginia needs to build out a highly flexible grid that can handle the intermittent power generation from those sources. That means investing in “smart” grid technologies. And it could well require building more transmission lines. This entry was posted in Energy and tagged James A. Bacon, Wind power. Bookmark the permalink. Appalachian Power is owned by American Electric Power headquartered in Columbus, Ohio. That is no stranger than Dominion’s purchase of gas producer and transporter Questar for more than $4 billion in Utah which some analysts say is too much. The dynamic that strikes me sometimes is that people appear to choose dirty power over clean power when it comes to wind and solar. They seem to prefer the coal plants…remote from their view. I don’t find wind/solar as any more or less “harmful” to “views” than I do pipelines or powerlines…. they’re all necessary… if we want the civilized life that electricity provides to us. We recently travelled from the southern end of the Blue Ridge all the way up to Lynchburg on the Blue Ridge Parkway which provides a wider look-down perspective on “scenery” but also rural, settlement patterns AND pipelines and powerlines.. and solar – not much – mostly in NC – and not a single wind turbine! We also visited Lake Jocassee just over the NC border in SC – which is a large pumped-storage lake complex (Bad Creek) which is pretty big size-wise but one third the size of Back Creek. Appalachian also owns a natural gas fired generating plant in Ohio. All the AEP companies are heavily interconnected via superb transmission links, so, electrically speaking, Ohio is not that far away. I also suspect Ohio has a much better wind resource profile than either West Va or Apco’s Virginia service territory, as well. The question is, why isn’t Dominion Virginia building more wind over in PA/MD/WV in the wind corridor over there, near us but not in VA? And why didn’t they already build more over there? Would be interesting to know numbers of wind turbines in that corridor, and list of who built them and who is purchasing? Believe Wash DC is purchasing from there. I’m only guessing, but it could be that wind generation could interfere with their nuclear generation. A good share of wind energy is generated at night and would probably displace some nuclear capacity in terms of cost. I would think there would still be a PJM market for one or the other though. I’m with Rowinguy on this one. Electrically speaking, OH is “not that far away.” Better sites in terms of wind profile than VA, probably cheaper land. Most importantly, better access to big transmission lines NEAR those better, cheaper sites. And, PJM pays essentially the same market price for wind power wherever in PJM it’s delivered to the grid. TomH raises the interesting possibility of a utility generating company competing against itself. Yes, but that applies wherever the units are located within PJM. And Dominion has at least considered its own wind construction, elsewhere. I usually favor renewable generation because it is free of emissions, has low to moderate impacts and a fixed price for 30-35 years, opposed to the moderate to high impacts associated with conventional generation and their increasing price trajectory. Because the energy generated from wind varies according to the cube of the wind velocity, location can make a huge difference in the output of a wind farm (that is why the towers are getting higher and blades are getting longer too). This means that certain areas will have significant advantages for wind production.The favorable areas now are the Great Plains, flat areas with strong prevailing winds such as Ohio and other states with lake effect winds, ridge tops or mountain passes that concentrate the wind flow, and future offshore prospects. This means that much of our new wind production will require transmission to get it to market. My concern is that the price and impacts of building transmission is not currently considered in making the project decisions for new wind installations (and for utility solar too). I agree that PJM and the Eastern Interconnect can allow for renewable resources that are optimally sited to supply distant markets, especially with some of the new dc transmission technologies. But for too long we have made energy decisions without an overall system view of their costs and benefits. We should include transmission considerations when deciding on the development of distant sources of supply, such as wind, utility solar, gas plants located near fracking fields, etc. There are many advantages to local, distributed generation ( or energy efficiency) whose benefits get overlooked because of our 20th century habit of a large central station spoke and hub arrangement, and or our history of ignoring associated costs and impacts of the individual project that we want to approve. Here is a write up about Goldman Sacks RE choice. I suspect a lot applies. “We (GS) wanted to closely match the generation of clean energy with the location of our consumption. There were several considerations in selecting the PPA, including competitive pricing, power market fundamentals, technology, environmental impact, and proximity to the location of our consumption” … in PJM. so in the end – since you can’t reduce nuke output on a variable basis… it’s baseload… then it’s a bit of a conundrum… like solar – wind is incompatible with baseload generation – coal or nuke. I’m just having trouble seeing how wind or solar can be accommodated if there is sufficient baseload available. And if you lower the baseload to accommodate/leverage the wind , you have to have a Plan B for when the wind dies.. cuz the baseload is not going to ramp up quick enough to cover the shortfall. they’re having to develop an entirely new paradigm for utility basic operation.. in order to figure out how to efficiently take advantage of wind and solar – while at the same time maintaining gold-standard reliability. Wind and solar are not incompatible with conventional generation. You can have both. We will have both for some time. The challenges that renewables can pose without a re-imagining of our energy system is that they undercut the price of conventional generation and make current generation operating in a baseload mode less economic. This is not a reliability issue. Currently, and probably growing in the foreseeable future, the US and PJM has a significant surplus of generation capacity. PJM has nearly twice what it needs to meet reserve requirements, so adding renewables does not affect reliability. The recently retired FERC commissioner, Collette Honorable, said renewables will not affect reliability “bring on more renewables”. You are currently seeing Dominion’s system as a bathtub where the inflow from their generation must equal their outflow from customer demand. This is not how the system operates. You must think of PJM as a Great Lake or of the Eastern Interconnect (all of the ISOs and non-ISO affiliated states in the east) as a huge ocean. These must generally balance. By encompassing a large area with diverse generation, variations in renewable output are very predictable and easily managed even at high penetrations of renewables. Two groups of experts are engaged in a heated argument about whether the grid can be entirely dependent on renewables by 2050. One group says yes – 100%, but the other group argues that perhaps renewables can contribute 80%. So whether we can or will have a much higher percentage of our energy generated by renewables is not so much in question. It is more about how much and by when. The real issue is economic. Utilities governed by cost-of-service regulations love very capital intensive conventional power plants that they can put in the rate base and earn a guaranteed return on for 35-40 years. The nuclear units fit that perfectly. Throughout most of their operating life, they could depend on high clearing prices during the peak hours of the day to provide them with significant profits. This is no longer the case to the same degree. The historically low price of natural gas over the past few years has driven out many of the coal plants and the higher cost nuclear units. As gas prices rise, lower cost renewables will push out many of the remaining coal plants and nuclear units. Over time renewables will also displace some of the gas-fired units, which will probably be paid to stay in reserve for prolonged periods of bad weather that would affect renewable generation. For right now, Dominion’s nukes will be bid so that they will run 24 hours a day. If Dominion adds some wind generation that produces energy at a lower cost than the nuclear units, it will be sold to PJM just as the nuclear output is. They will be paid the appropriate wholesale rates for this generation and will buy power from PJM at the locationally marginal priced wholesale rate to meet the needs of their customers. More renewables over time will lower the wholesale cost of electricity. More distributed renewables and energy efficiency will lower the amount of energy needed to be produced by utilities. Regulators and utilities must adapt to this new environment. Let’s take a nuke plant. Let’s say we’re going to build some wind/solar next to it. how do you coordinate the output of the Nuke Plant in response to how much wind and solar is being generated? Can you modulate the nuke – to lower output when solar/wind come on strong and then ramp the nuke back up when wind/solar decrease? so maybe there is something I’m not seeing.. but it looks like to me that if you cannot quickly ramp the nuke up and down and must run it at a set output level… what would you do with the additional but varying output of the wind/solar? that’s why I say it’s incompatible. ANY source that varies in output is going to be not compatible with ANY source that cannot vary… if the demand stays the same. The only way it would “work” is in demand increased .. and wind/solar – at that time were also generating… an ideal but random circumstance that could not be counted on. More likely demand would vary, the baseload could not.. and you could not count on wind/solar picking up the difference. What Acbar and I and others have been trying to explain is that the nuclear unit and the wind and solar generation have little to do with one another. If the nuclear unit is bid into the PJM auction at $0, it will be dispatched all of the time (run 24 hours a day). The wind and solar units will probably be sited where the wind blows the most or the sun shines reliably. The renewable auction is separate from the dispatchable auction. In the east there is such low renewable penetration that it will be many years before we would be confronted with the choice to dial back nuclear units or dump renewable output. PJM is well connected to other areas so it is likely that any excess low-cost energy could be passed on to other regions (this is not the case in California). Much of PJM’s capacity is made up of units that can vary their output and those are the ones that will be directed to make changes in their generation. Over time it is possible that the nuclear units will be priced out of the market. Perhaps there will be a bonus paid to flexible generation, essentially penalizing nuclear units that cannot mesh with the evolving grid. Most of the nuclear fleet in the US is over 40 years old. It would be fully depreciated if many of the units hadn’t been sold over the last decade or so to merchant generators. Some of these merchant generators such as Exelon are mostly invested in nuclear units they bought cheap from the original owners. They have asked for subsidies because the units have not been able to compete economically. The Illinois state legislators granted them several billion in subsidies over a few years because they did not want to build new gas-fired plants (because of climate issues and likely higher gas prices) and they wanted to protect a big local business that were huge political donors. So it will be a few years as this all sorts itself out. In the meantime, lots of turmoil and politically motivated decision-making. In my opinion, nuclear units will gradually decline as a percentage of generation (energy efficiency already contributes more than nuclear in the US). New nuclear units cannot offer a competitive price for energy. Old units will also have trouble competing on price. Their advantage as low-carbon generators will not compare to the much lower prices offered by zero-carbon sources such as energy efficiency and renewables. We will have challenges and bumps in the road (but not likely to have reliability issues) as the old system transitions to the new. The difficulty will be when different constituencies want special treatment for their favorite technology that distorts the market pricing mechanisms. @TomH – hey… I much appreciate you being patient! but if we distill this down to one baseload unit … and wind/solar… it don’t “work” – agree? that’s where I’m coming from when I say the two are incompatible. The only way to “meld” one baseload unit with wind/solar is to run the baseload unit at a lower level… and use wind/solar when available – and gas when they are not – to cover the gap between a reduced baseload plant – and higher than baseload – demand. OR , without gas – you could just take baseload turbines offline and let the wind/solar generate but you’re still “burning” the baseload fuel.. there is no savings there… you’re using the same amount of baseload fuel.. just not using that fuel to spin turbines. so in the more complex environment – instead of taking turbines offline – you might auction the excess – and use wind/solar instead – with the proviso that if wind/solar went away – you’d want your turbines back or you’d have to go to PJM to buy additional power to replace what you had – but lost from your wind/solar. So .. this is an enormous and complex routing and re-routing of power across PJM … and there are physical limitations as to how much of it can be done without destabilizing the grid. so back to the one baseload plant with wind/solar. You’ve sold the excess baseload to PJM so you can harvest the wind/solar… wind/solar die.. and you need power to fill the gap… your own turbines are promised to whoever bid and purchased when that excess generation was available. How soon can you reclaim your baseload plant to backfill where your wind/solar went away… OR.. are you going to have to go to PJM yourself and bid on power to make up for the wind/solar going away? PJM has given a number.. I believe.. as to just how much wind/solar they can have in the region .. that they can accommodate and cope with variation in output – by routing backup power when wind/solar die… and it’s something like 20% or so if I recall… that 20% is not some arbitrary number plucked out of a hat.. it basically is a measure of the grid’s ability to route and re-route power to meet varying demand – and still maintain reliability. I don’t see how that changes as more and more wind/solar come online because actually the more wind/solar you have – the bigger the risk of having it drop and having to replace it with something else – quickly enough. Isn’t this the problem that California is having? They have LOTs of solar but when the solar goes away – they have to scramble to replace it – and they cannot do it with baseload. I’ll try and keep this simple. You can ask more questions about what doesn’t make sense. I think a basic concept that is making things more confusing to you, is that you assume Dominion meets its own needs with its own plants (baseload or solar or whatever) and sells the rest to PJM. It doesn’t work that way. PJM tells every generator when to start up and when to shut down (it is not decided by the owners of the plant). The output of every unit, whether owned independently or by a utility, is old to PJM. PJM decides what unit gets turned on next based on its “bid” or usually its operating cost. Cheaper units get turned on first and run longer compared to more expensive units. All units operating during a particular time period get paid the price of the highest cost unit used during that time period. The cheapest units run all day (baseload). As demand increases more units are turned on according to their merit order (the next cheapest unit). Then as the peak usage is reached, units are turned off basically in the opposite order they were turned on. Since the electrical use on the grid never goes to zero (except during large scale blackouts), some units run 24 hours a day (baseload). It is never just one baseload unit and one variable unit such as solar. All of the generation gets put into a big pool and electricity is withdrawn from the pool when and where it is needed. So a nuclear unit and a solar unit would not directly respond to one another even if they were sited at the same location. It is PJM’s job to balance and account for the turning on and turning off and putting in and taking out of energy. They have a well developed and highly sophisticated system to do that. It is complicated a bit by the use of renewables because they do not turn on or turn off. That is why PJM handles them differently. PJM has said that the current grid can handle up to about 30% of its capacity in renewables before significant grid improvements are required. This does not mean that the grid cannot handle more than that. It means that to provide a stable grid with a higher amount of variable output, better controls are necessary, so we would need to modernize the grid. Which is what we need to do anyway, even if we did not develop more renewables. More renewables just means we would need to do it sooner. California is having the problem you describe. They have a good deal of solar during daylight hours. But their peak is in the evening, so as the solar contribution declines they have to ramp up quite a few units in a short time to replace the solar amount plus meet the higher evening demand. They also have a problem on sunny days when the load is moderate. The solar contribution is so great it can cut into the baseload, requiring them to curtail conventional units (if that is possible), sell power to neighboring states (sometimes below cost), or dump some of the renewable generation (wasting money by not using zero cost energy). By the way – as I write here.. I’m watching my own cooperative “adjusting” on the demand-side by upping my digital thermostat by 4 degrees… to help level-out the peak… pretty cool.. I can always bail if I want.. but I usually don’t..
That is so great. Demand side management such as this will replace some of the need to add new generation by shifting loads and reducing peaks. Many new technologies will be coming along that will be cheaper than adding new generation. Let me give a more discrete, clear cut example. Take an island – that wants to use wind/solar. that wind/solar are not adequate? is there any value in that perspective? Your skepticism is well founded. In energy production, the only certainty about the future is chronic uncertainty that arises from the nearly infinite complexities within and outside the control of producers within the market. These many threats arising from the inherent uncertainty of the industry’s future are compounded in its arena plagued by long lead times, high costs, and built in resistance to change should one limit one’s future options and flexibility in an industry where where reliability is absolutely paramount. All of this demands strong ongoing diversity that is complimentary within its parts to the highest practical degree. Limitings one future options within this matrix of risks is highly irresponsible given the irreplaceable roll electricity plays in our survival. It is also unnecessary in these times of profusion. Let’s use Kaua’i as the example since we are both familiar with it. For years The Kaua’i utility used diesel powered generators for all of their electricity. Then they added a naphtha-fueled combined cycle unit. But all of the fuel has to be imported so the costs are high (nearly 35 cents/kWh for residential rates). The Kaua’i Co-op added a utility scale solar array as soon as it became economic to do so. This contributed low-cost power during the sunlight hours and displaced many hours of use of fossil-fired generation. But their peak was in the evening. The fast-starting diesels were used to cover variations in solar output. But fortunately, the sun shines most of the time and summer days are only a few hours longer than winter days, not 5-7 hours different as happens in many northern parts of the US. But they still had to deal with the peaks in the evening. As battery prices fell, they added batteries that provided 4-5 hours of electricity after sunset. This allowed solar power to contribute a significant portion of the peak. As well as having batteries to handle daytime variations in solar output. The combined cycle plant covered the baseload needs and the diesel powered units filled in the rest, as needed. The second facility they are installing will use solar panels plus batteries to produce power at 11.5 cents per kWh, which is about the residential price for electricity in Virginia. In another 5 years, the price of the output of a similar new facility will be about half of that amount. The price of output fell from 14 cents/kWh for Facility 1 to 11.5 cents/kWh for Facility 2, in just one year. This is an indication of where the mainland US energy system is heading. The price of solar and wind is becoming cheaper than any conventional source of generation other than hydro. Solar output will be contributing a greater and greater portion of the daytime load as distributed and utility scale units come online. Daytime variations in output from renewables will be covered by fast-responding peaking units. The baseload demand will continue to be met by nuclear, coal, and gas-fired units, of which we have a surplus. Amounts not provided by renewables during the intermediate and peak periods will be covered by gas and oil-fired units (again we have a surplus in PJM) and peaks will be supplemented with hydro, as well. As batteries continue to decline in price, they and other types of storage will also be used to handle output variations and other grid services (voltage and frequency control, etc.). This is why I am warning that adding too many new conventional units will harm the ratepayers. It is expensive to allow our demand to increase. It would be far cheaper to keep it stable with energy efficiency. Adding a new power plant to handle a projected load increase raises rates immediately and rate payers must pay off the new unit for 35-40 years regardless of whether it is used as expected. This is a dangerous assumption with all of the new energy technologies being developed and rapidly declining in price. Unfortunately, the utilities benefit from this but the risk is borne by the ratepayers. This is the inequality that must be remedied. “… HECO’s new draft plan “focuses on near-term improvements that provide the most immediate system and customer benefit but don’t crowd out future technological breakthroughs,” it noted. You are both on target. Reed is exactly right in that diversity makes ecosystems capable of withstanding a variety of unforeseen events. We need to expand to a variety of choices in how we deal with supply and demand. That is why I have been cautioning about overdoing it with a supply-side only approach using the same basic three choices (coal, nuclear and gas) for our new generation. We will have these three options in our energy system for the next 40 years at least, but we should not over-invest in them in ways that exclude additional choices. As Clean Air & Water suggests the fundamental need is to move to a modern grid that allows for a two-way flow of energy and information. And move away from the old exclusively central-station, hub-and-spoke mainframe-like model for our energy system to a modern network style system with advanced information and control capability. This will accommodate both centralized and distributed generation and a multitude of energy services to add convenience and save energy and money. Ray Kurweil, the director of engineering for Google, projects that by the end of the 21st century we will have experienced 20,000 years of technological innovation (based on our current rate of innovation). It seems high to me, but what if he is off only by a factor of 10 or 100? We still might be exposed to a dizzying rate of change. We cannot lock ourselves into last century’s energy system for most of this century, just for the short-term profit of a few industries. The customer is not benefiting from the path we are on. We have few choices and costs are going up. Larry, I am out of town and on the move. I will answer your questions as soon as I can. I’m still a skeptic on batteries for anything but short term transitions.. to cover what comes up after solar goes down, etc. When batteries that can “cover the night” come along.. there is a huge gap between the optimism of promoters and the reality… unless and until there is some fundamental breakthrough in the core technology. Batteries are the holy grail.. and I’ll be the first to cheer but until the – pragmaticism is the right mindset. I’m also heartened to hear that TomH recognizes that EVEN fuel oil is still needed no matter how much solar you have… ergo – baseload… fuel oil, coal, nukes. We will continue to need baseload – to be the default electricity source… and then leverage the renewables… and use gas to cover the gaps. The impacts to reliability will limit how much solar can be accommodated until the grid is modernized.. which means switching stations and infrastructure to react to wider scales to fluctuating solar/wind inputs. example.. Hampton Roads might actually be able to run solar for much of the day … as long as you can shunt other power quickly in large enough capacity to cover when solar can’t. How do you do that – grid-wise? I’m 100% on board with any/all technologies on the demand side and even utility industry folks are admitting that those technologies are going to revolutionize consumption… while also being rightly concerned that between them and solar – the grid itself is going to be subjected to enormous changes in tempo … as solar, wind and demand-side will rapidly vary in real-time.. and the grid will “feel” it. at the bottom of all of this is the utility industry ..saying.. ” How can we assure there will be no rolling blackouts as this evolution continues and accelerates”? and that’s a legitimate worry – for all of us. “100 % renewables” as a catch-phrase needs a “come to Jesus” moment. we need to see those folks – “get real”…. IMHO. I want to see more down-to-earth admissions from them. The reality is – for as far as the eye can see – IMHO – baseload and some level of fossil fuels… we need to squeeze them smaller and smaller.. when and if we can.. but like on Kaua’i – only when we see their fuel-oil burners go offline permanently will we really “be there”. I think where our opinions differ is that you view the future of our energy system based on the way it has been in the past and is currently. My recommendations have been about what we do next, what our choices for new additions to the system should be. I have always said that we will have significant amounts of conventional generation in our system for decades. Where I differ with many others is that I do not believe we should add many units using the old technologies because they are such a bad fit with the trends happening in the energy sector. We are moving towards a system that gives consumers more choice, with lower energy costs, more flexibility, more clean power, more decentralized, with more opportunities for innovation and third-party participation. Building more coal and nuclear increases costs and reduces flexibility. Gas allows for flexibility but increases costs and emissions. It is so cheap and beneficial to keep our demand stable using energy efficiency. It is only our obsolete regulations that force utilities to build more to earn more that is keeping this from happening. This would allow us to use units we already have to meet the nighttime load while we add appropriate new technologies to provide better, lower cost service during other times of day. The electric vehicle issue is a case in point. You describe EVs as a possible destabilizing force to the grid possibly causing an increase in demand at night. This is correct from the historical 20th century view. But EVs could be the ultimate demand response tool. As we add solar and EVs to a noticeable degree 2020-2025, excess solar output during the daytime could be shunted to a new demand (demand response works both ways). EV batteries that are already paid for could be recharged while they sit in parking lots at work. This would soak up cheap solar and return it to the grid after the sun goes down. Or keep it stored for later use for transportation, avoiding the need for nighttime recharging. This would give the EVs the lowest cost energy and could even earn car owners a small fee. The grid remains balanced, baseload units are not stressed with too much or too little demand. This is my point. They way things will work in the future are likely to be far different from the way they work now. Our assumptions will be turned upside down. This is why I am so concerned about using old thinking to make new plans. This is why I see things differently than you suggest. You say that batteries and other modern technologies will not “be there” until they totally replace existing technologies. I think you mistake my advocacy for these modern technologies as a call for them to be the “only solution”. My point of view is that batteries are already “here”, because in many applications (such as in Kaua’i) they are the most cost-effective choice. That does not mean that I believe that they should be used everywhere regardless of the circumstances. As their cost comes down they will increasing displace the higher cost peaking units, because they are easily placed where most needed, will respond faster and less expensively than the fossil fired units. That doesn’t mean the old units won’t have value. They are still useful to cover periods when renewable output is reduced for prolonged periods. I don’t believe any single technology will be the primary one, displacing all others. We need diversity and we will soon have choices that we can’t even imagine today. I just don’t want to spend so much on the old technology that will take decades to pay off that we foreclose the opportunity for new innovations to serve us. FERC commissioners and energy experts say that we can embrace this new future without fear of reliability issues. That bogeyman is being raised in this age of surplus generation only to increase fear and cause policymakers to hesitate in embracing newer options. It is a scare tactic used by old industries under siege from better, cheaper technologies. I often drive by some of the PA/MD wind turbines on I68/70/76, and oft times some or all visible turbines are not spinning. I assume this is saving wear and tear in periods when the power is not needed. Re: Dominion Virginia, I agree nuclear capacity is a possible rational for less wind. However, I would let rate payers pay more for green energy if they insist they want that. Wind turbines have a startup wind speed of 8-12 mph. The blades are not spinning usually because that threshold has not been reached. The turbines are also designed to alter the pitch of the blades to extract the most energy from the wind and will rotate out of the full force of the wind to avoid damage at high wind speeds. Wind generators usually operate whenever they can, because, currently, they qualify for a production tax credit of about 2 cents/kWh. That is why excess wind energy in Texas sometimes sells for $0 or less, and the wind generator can still make money. A few years ago, green energy tariffs were more expensive, because renewables were more expensive. I am disappointed that Dominion and APCo still want to charge a premium for green energy in Virginia, when it is less expensive than other alternatives now. Not too long ago our choice was either cheap energy that made a mess or clean energy that was expensive. Nowadays, the clean energy is cheaper and will keep a lid on our energy costs if we let it. I’ve noticed also that the turbines up there are sometimes “idle”. I don’t know why but surely return on investment seems affected. But in a bigger-picture way – PJM feels like an enormous mega-utility – that automatically figures out the most cost-effective and expeditious way to generate – and route power in real time to where it is needed. So I’m totally ignorant at how the PJM auctions actually “work” other than folks like Acbar/TomH have said that there are separate auctions for renewables… and I presume there is a reason why and the variable nature of renewables might be part of the reason. So Nuclear is a fuel that seemingly would be “king” at night… They can deliver “X” power for “Y” period of time – unless the plant unexpectantly goes down. You have described PJM’s function well. They also do region-wide forecasting and generation planning. PJM recognizes that value of having units that can turn on or off as needed (dispatchable). They hold a capacity auction 3 years ahead. The auction determines the value paid per unit of capacity (I think it is paid each day the unit is available). This has nothing to do with the energy produced by the units (these are covered by day-ahead and hour-ahead energy auctions). The units are paid because of the value they provide to the grid for being available to generate (they have to meet certain availability standards). The renewables units do not get this extra payment because they cannot generate on demand. Nuclear can be “king” at night if their price is right. Dominion is one of the better nuclear operators in the US. Their Millstone nuclear plant is supposed to be the lowest cost unit in the US and the most profitable. North Anna and Surry are in the top 10 or 20 most profitable nuclear units in the nation. Many nuclear units currently operating are losing money. Nuclear units have a prolonged outage about every 18 months for refueling, so this has to be accounted for. Reading the Hartford Courant … Here is the news from the most profitable nuke in the country!! The corporate owner of the Millstone nuclear plant on Monday again raised the possibility it may shut the Waterford plant following the state legislature’s refusal to let it sell energy more expansively than it now does. …. Thomas P. Wohlfarth, senior vice president of regulatory affairs for Dominion, said nuclear power plants in deregulated markets require the “same sustained capital and operating investments” as in states with regulated energy markets. “However, it is becoming increasingly apparent nationwide that deregulated energy markets are not conducive to these sustained investments,” he said. Dominion lobbied hard since January for the legislation, which it says it needed to help the Waterford plant compete with relatively cheap natural gas. Several nuclear plants nationwide have closed recently as natural gas overtakes nuclear energy as the preferred source of power. Dominion bluffed that it would close the Millstone nuclear plant hoping that it could get a subsidy like those provided to nuclear units in other states. The Connecticut legislature called the bluff. Dominion decided to continue operating the nation’s most profitable nuclear unit at least until 2022.
does that imply that Dominion IS getting a subsidy in Virginia? what Dominion said in their statement: ” …nuclear power plants in deregulated markets require the “same sustained capital and operating investments” as in states with regulated energy markets. that does not seem to imply subsidy but then again it doe imply ..something… “. Finally in terms of night time – and baseload and Nukes being “king”. what would you use instead of Nukes for baseload at night ? All nuclear units receive subsidies. Nuclear is the most heavily subsidized of any type of generating technology. The two largest taxpayer-funded nuclear subsidies are the loan guarantees (without which no nuclear plant could be built) and the insurance subsidy that amounts to $0.20 to $1.20 per kWh (about 2-20 times the retail cost of electricity), without which no nuclear plant could operate. That is not the type of subsidy that Dominion was pursuing. That was a operating subsidy. As you can see from the chart, many nuclear units cost more to operate than they receive in payments from the energy markets. Since 2015 six nuclear plants have been closed across the US and there are plans to close another eight. In New York, they are concerned about climate change issues and wanted to avoid building any new gas-fired plants, so they came up with “zero-emissions credits” to apply towards the economically under-performing nuclear units. This will cost New York ratepayers about $7 billion over the next 12 years, but will keep several thousand people employed at the nuclear units and local tax payments flowing. The Illinois legislature awarded Exelon $285 million per year to keep several of its financially ailing nuclear units open. A number of competitors have filed suit saying this subsidy infringes on FERC’s right to regulate wholesale energy prices. When owners of nuclear units in other states saw that state legislatures were willing to hand out subsidies, they began pressing lawmakers in Connecticut, New Jersey, Ohio and Pennsylvania for action too. This “free money” is what prompted Dominion to ask for a subsidy for its Millstone facility even though it was far from the unprofitable situation that the other units that asked for handouts were in. New York will close the Indian Point nuclear units in 2020 and 2021. The over 2000 MW of capacity is expected to be replaced by a combination of renewables (mostly wind I think), energy efficiency, and significant imports of additional hydro power from Ontario. Dominion does, in a sense, have a “subsidy” for all of its units in Virginia. The marketplace is showing that in many places nuclear units are not economically competitive, although all of Dominion’s nuclear units are profitable. Virginia moved to deregulate the generation of energy from providing retail electricity, as did many other states, in the late 1990’s. It is this “free market” that is penalizing the inflexible, higher cost operation of many nuclear units. Many utilities want the benefits of a free market when it makes them a profit, but then want the shelter of a “managed” market when it becomes harder to make money. It is like the banks, who want to keep all of the profits from their risky endeavors, then want the tax-payers to cover their loses. It appears that, in Virginia, Dominion prefers to let the ratepayers carry the risk. They are content to gain a roughly a 10% return for normal utility activities, plus a 15% return for an expensive and unnecessary pipeline. They also gain a benefit from a special form of subsidy in the form of the rate freeze. This is withholding perhaps a billion dollars from ratepayers and is shifting it to the parent company for extra capital for new projects or to pay shareholders and keep the stock price high. This does not have anything to do with nuclear units, other than the return on the hundreds of millions spent on gaining a license for North Anna 3, that ratepayers are unlikely to receive any benefit from. A Dominion bluff in CT sounds about right. As I read the nuclear issue … new plants are prohibitively expensive and the few proposed are, like Anna 3, at locations with other nukes on site and therefore meeting some citing requirements. That doesn’t answer your ‘night’ question, Larry but it does sound like a very good reason for Dominion to proclaim that deregulated markets aren’t working for nuclear plants and to block any efforts to expand deregulation into VA.
“As PG&E acknowledges, market forces have made California’s last nuclear plant redundant. 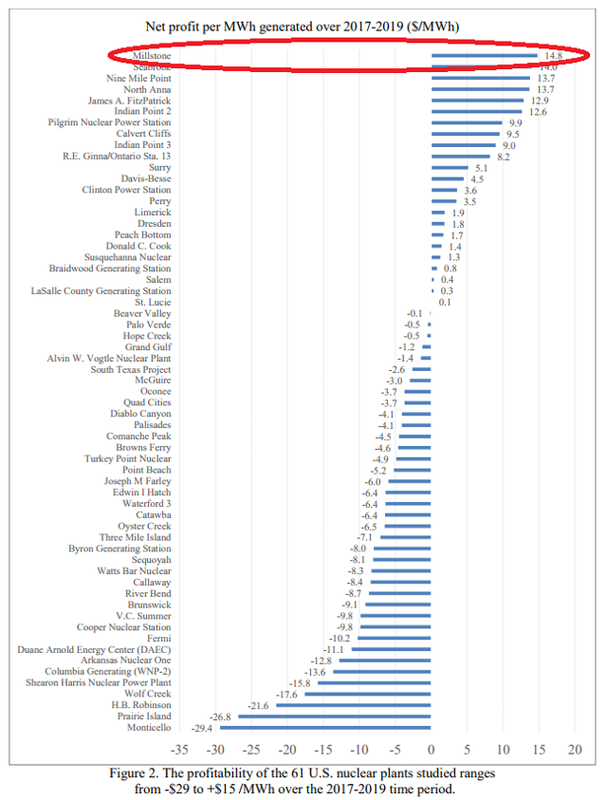 … Diablo Canyon has become cheaper to close than to run.” It’s at-4 on the list. so what provides power at night? isn’t it a sort of a “pick your poison” dilemma? the irony here is that hydro is “supposed” to be a eco-friendly renewable” but the pump-up was to this point always intended to be powered by coal or nukes. and hydro can essentially then supplement/replace baseload.. when solar is not available.. i.e. .. hydro becomes a solar “battery”. but that still does not resolve the larger problem which is – what do you use to power the night? no wiggling now.. let’s be forthright. and no.. I do not buy the “battery storage” idea… not for some time.. if ever. Chesterfield coal 1267 MW retire in 2022? Clover coal 439 MW retire in 2022? Mecklenburg coal 138 MW retire in 2022? Baseload Total- 11,749 MW 9905 MW after 2022? Looking at the load curve in the 2017 IRP, the minimum load is at least 7000 MW or so 100% of time. Demand exceeds about 11,000 MW perhaps 20% of the time. We have this amount of capacity to serve a baseload demand at least until the early 2030s (2032 & 2034 for Surry) and I think 2038 and 2040 for North Anna, when these units complete their 60th year of operation. Early estimates are that it will cost at least $3 billion to make it possible to extend the operating licenses for another 20 years. So we have adequate capacity to meet baseload requirements without adding more for a long time, especially if we use inexpensive energy efficiency to keep the load stable. PJM has a nearly 29% surplus in capacity (twice what is needed) and 190 new gas-fired units are planned or under construction in PJM territory. We are not in any risk of not having enough capacity to meet baseload requirements. In fact, we risk having far too much, causing ratepayers to pay more than necessary and harming utility economics as well. Sorry. It looks like the formatting will not carry over for the table of generating units. Sorry… I’m not buying the “battery” thing until I see it in real use or planned to be in real use in a year or two. Otherwise , it’s primarily a hand-waving exercise “into the future… sometime”. so the question remains… and it’s a simple one.. what powers the night ??? I see a whole bunch of articles about batteries, compressed air… pumped hydro… but .. right now… in California.. or on the thousand or more inhabited islands in the world – right now – tonight. I think this is an exceptional important question for the CREDIBILITY of the “green” community. Are we going to deal pragmatically with the realities or are we going to continue to hand-wave at the future? Don’t mistake my own hopes and wishes, .. I want to see that future as much or more as the most ardent … but I am also compelled to deal honestly with the here and now.. and it’s one of my annoyances with the “green” folks because it gives opponents ready ammunition… to marginalize them. Dominion can and does easily dismiss these folks as living in la la land which then degrades the rest of their message about wind/solar in general.